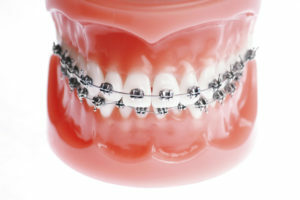 Braces use brackets connected by wires to encourage teeth to move. Aligners are a series of tight-fitting custom-made mouthpieces that slip over the teeth. Once our orthodontist decides how to correct your bite, a plan is made for moving your teeth. If you get the clear aligners, you’ll be fitted for several versions that make slight adjustments to move your teeth over the treatment time. They’re made from a clear plastic or acrylic material and fit tightly over the teeth, but can be removed for eating, brushing, and flossing. You’ll get a new aligner every few weeks to continue moving the teeth into the desired position. Our orthodontist uses ClearCorrect Aligners and MTM aligners. Can anyone get invisible teeth aligners? Because the invisible aligners are custom-built for a tight fit, they are best for adults or teens. Straightening a child’s teeth is more complicated. Young people, and their mouths, are still growing and developing; the doctor must think about this when setting up treatment. Clear (or “invisible”) aligners aren’t for everyone. Our orthodontist can help you decide what’s best for you. When to use clear aligners? Clear orthodontic aligners are typically used for patients who have mild or moderately crowded teeth, or have minor spacing issues. Patients who have severe crowding or spacing problems — or severe underbites, overbites, or crossbites — may need more complex treatment. How long does it take to straighten teeth using invisible aligners? Treatment time with invisible teeth aligners is based on how much the teeth need to be moved or rotated. The more your bite is off or the more crooked your teeth, the longer it will take. Treatment usually takes between 10 and 24 months. But if you’re an adult who had braces as a child, and your teeth shifted slightly over the years, you may need invisible teeth aligners for as little as 10 weeks. 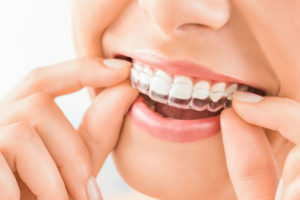 Because invisible aligners are not as precise as traditional braces, some patients may require a “refinement” of their teeth using braces for a few months to make other, smaller adjustments at the end of the treatment. Why use invisible aligners instead of braces? Avoiding “metal mouth” isn’t the only reason to choose a clear aligner. Unlike braces, aligners can be removed, making it easier to brush and floss well; that helps maintain better overall oral health. You will be diagnosed and treated by our orthodontist. An orthodontist is a dentist that has had an additional 2-3 years of training beyond dental school and specializes in the movement of teeth. Many general dentists are very capable of monitoring the stages of tooth movement but none have the specialty training provided by post-graduate orthodontic school.